A few years ago I fulfilled a childhood dream of mine and spend 2 months in French Polynesia. When growing up I would hear songs about Bora Bora or Tahiti and my mind would immediately wonder to this paradise, longing to go there and knowing that one day I would visit this magical islands, little dots in the middle of the South Pacific. You can just imagine my overwhelming joy when I stepped off the plane in Tahiti on a beautiful balmy evening and local women handing out a Tiare flower to each person arriving. Was I dreaming? I was wondering if it really was the way I dreamed it would be all these years? Well – it was even better than I could have imagined! I was privileged to have a friend who was living on Tahiti to take me around the island and introduce me to all the island’s hidden gems. Tahiti has Polynesia’s two highest peaks one of them being Mount Orohena, the dwelling place of the ancient Gods. As we circumnavigated the whole island the scenery changed with every turn. From the bustling city of Papeete the roads lead through small villages along the black velvet beaches on one side, and waterfalls cascading through emerald valleys on the other. I wondered what would await us around each new corner! One of my most memorable experiences was stopping at a small old wooden church along the wayside – I still remember the serenity and peace I felt there. 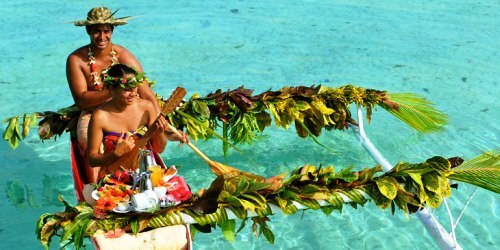 While in Tahiti I also had the opportunity to visit Moorea and Bora Bora. 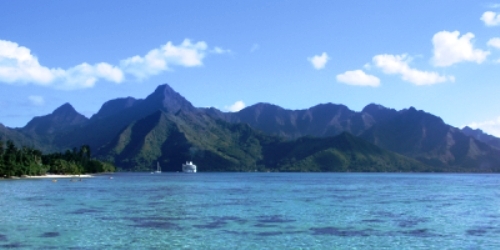 Moorea is only a few minutes away by boat from Papeete, yet so different. The pace of life is very relaxed yet the scenery dramatic. With emerald mountains rising up from its sandy shores, this island has been an inspiration to countless artists, writers and poets. It certainly inspired me to forget everything around me enjoying the peaceful atmosphere and spirit of this magical island. A few days later I was off to Bora Bora. On my hour and half long flight I remembered the songs I heard about Bora Bora when I was a little boy and how I wished to go there. Here I was only minutes away from that dream. Words can’t describe the beautiful views of the coral reef dotted with emerald islets encircling the main island like a string of pearls. The center of this dramatic setting is Mount Otemanu rising out of the ocean with countless colors of blues and turquoises. Bora Bora is perfect for snorkeling and scuba diving with its amazing array of brightly colored fish and beautiful underwater coral formations. French Polynesia is known to be the perfect honeymoon destination. 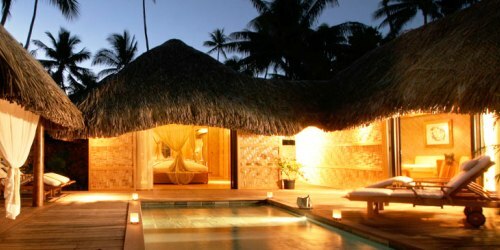 What better way to celebrate romance than to spend a week in an over-the-water bungalow (with glass tables for viewing the underwater sealife) or indulging in Thalasso spa therapies? Truly you won’t want to go home. 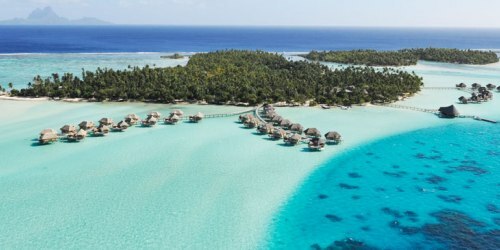 Whether you are going for your honeymoon, taking a wonderful family vacation or just want to be inspired by beauty, French Polynesia will surely make your heart sing.